When it comes to fences, Chesley Fence & Deck has more experience than any other company from Belleville, Illinois, to St. Louis, Missouri. 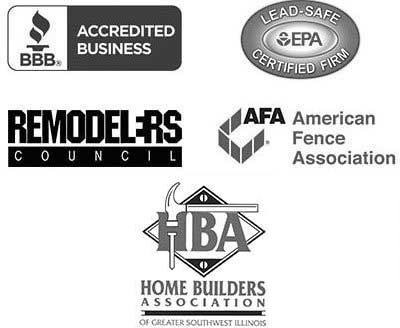 We have been serving the region since 1967, and through the years we’ve earned a reputation for providing honest, reliable service along with the highest quality fencing products. Vinyl fencing – Our vinyl fences are made by the trusted manufacturer CertainTeed. 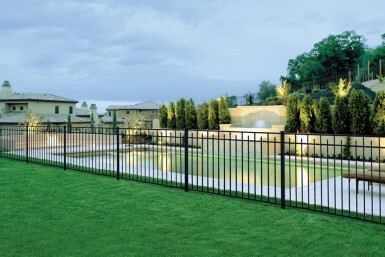 We offer the Bufftech® Fence, which is manufactured by CertainTeed. Our fences are more durable than those offered by most of our competitors and are also exceptionally low maintenance, as they will never require staining, painting, or sealing. Plus, the parts fit together seamlessly, making it an attractive addition to your property. Ornamental aluminum fencing – This is among the most attractive fencing available and comes with no visible rivets or screws for optimal visual appeal. It also undergoes an 11-step powder coating process to ensure that the paint will not flake or peel, resulting in exceptional longevity. Homeowners who choose our ornamental aluminum fences enjoy a lifetime warranty. Cedar fencing – We use only premium Western Red Cedar that is far sturdier and more resistant to warping and cracking than treated lumber. This budget-friendly option has a beautiful, natural wood appearance that will enhance the look of your yard. Regardless of which type of fence you choose, you can rest assured it will be installed by a team of experts who adhere to the highest standards of quality craftsmanship. Our strict installation practices, which include mixing our concrete onsite and using true 2 x 4 rails in our cedar fences, ensure maximum durability and longevity for our fence projects. Additionally, Chesley Fence & Deck is known for going the extra mile to deliver to customers fencing that perfectly suits their unique needs. We can install fences in virtually any configuration. For instance, if you’re interested in one of our ornamental aluminum fences but are concerned that your pet will escape through the pickets, we can install the fencing with two inch gaps instead of the standard four, keeping your pets enclosed and safe. If you’d like to learn more about the fences that we offer to homeowners in Belleville, IL, and all surrounding communities, contact Chesley Fence & Deck today. Click Here to Build and Price Your Fence Online!